In this blog I want to discuss the final recommendation of our submission to Ontario’s process for updating its Long Term Energy Plan (LTEP). This recommendation encourages the provincial government to “ensure market renewal initiatives support renewables”. Ontario’s Independent Electricity System Operator (IESO) began a Market Renewal Initiative process in 2016, which, among a few other things, is focused on securing electricity supply through capacity auctions. This mechanism for securing electricity generation favours generation options that offer firm power, such as natural gas. Renewable options such as wind energy that cannot guarantee firm energy supplies for specific time periods cannot compete effectively in such a market. Would this be good for Ontario and its electricity customers? Not if your objectives are to keep both carbon emissions and electricity prices as low as possible. Moving to acquire electricity supply through capacity auctions in Ontario is likely to result in increased natural gas generation and more greenhouse gas emissions. Wind facilities with expiring contracts may choose not to extend their operation, and new projects may choose not to proceed. Ontario would have a much harder time achieving the objectives of providing the lowest cost electricity as well as meeting the goals of its Climate Change Action Plan. Wind energy remains a low-risk, non-emitting option for Ontario that can be built relatively quickly, with a track record of delivering projects on budget, and with contract prices that are making wind power the lowest-cost option available to the province. Ontario currently uses competitive procurements to secure long-term wind energy contracts. This balances the needs of both electricity customers for affordable prices, and wind developers for an adequate return. Having wind projects compete to find the lowest prices keeps costs as low as possible for customers. This is how other Canadian jurisdictions procure new wind power, and how Ontario locked up power for as low as 6.45 cents per kilowatt hour in its latest procurement process. In addition to long-term contracts, there are a number of innovative market opportunities that the IESO should be considering to ensure non-emitting and low-cost wind remains an option for Ontario. For example, wind can be coupled with other resources and technologies to deliver both capacity and energy. The electricity trade agreement between Hydro-Quebec and the IESO for 14 terawatt hours of electricity between 2017 and 2023 illustrates the potential for this on a macro scale. Combining this hydro with Ontario wind energy would give the province the ability to optimize existing variable output capacity with the goal of exporting the wind generation to Quebec (while they are filling their water reservoirs) in exchange for the firm import of Quebec hydro power to meet peak Ontario demands. Market reform could incent and encourage such innovation at a project level. Wind is also a natural for bilateral contracting with end users for clean energy. Google, for example, is entering into long-term contracts for renewable energy to power its data centres in other jurisdictions. It consumes about 5.7 terawatt hours of electricity annually and has a goal of powering 100 per cent of its operations with clean energy. This type of opportunity would be a natural fit for Ontario wind energy. 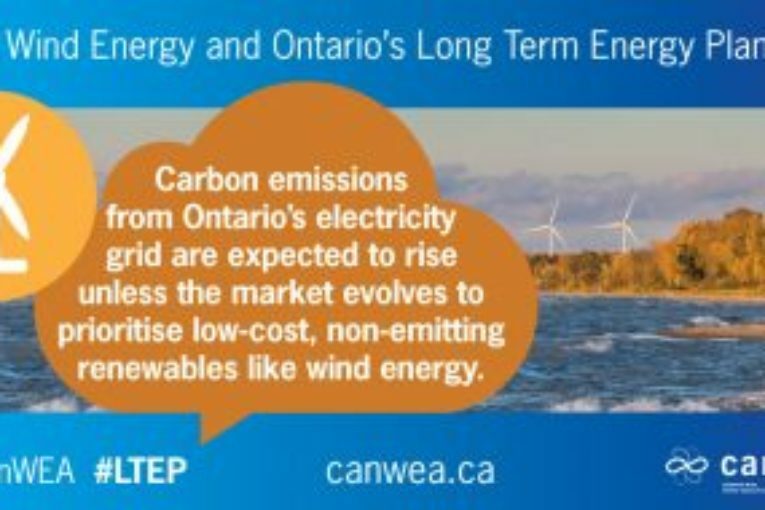 To pursue these market opportunities, to achieve our climate change goals, and to keep electricity affordable for Ontario customers, the province needs to maintain its current practice of competitively procuring wind energy as it designs market renewal initiatives that are positioned to acknowledge and support the benefits that wind energy can offer.